John Milton (1608-1674) is considered one of the most important English writers of all time, ranking with Shakespeare and Chaucer. Milton was a devout Puritan and was disowned by his Catholic father. Unlike many Puritans of his day, Milton did not condemn recreational enjoyments, like art, sports, and theater, and he loved music. Milton was probably the most educated of all the English writers up to that time; he knew five languages, and the Bible almost from memory. Milton became completely blind by the age of 44. Milton believed he was called by God to speak out against society’s evils. He wrote pamphlets on topics such as marriage and divorce, censorship, and politics. Milton’s other literary works include 23 sonnets, several elegies and odes, a masque drama, and a dramatic poem. Paradise Lost (1667), his opus magnum and best-known work, is considered by some to be the greatest poem ever written. Paradise Lost is a narrative about the fall of Satan and the subsequent fall of Man. Before reading the poem, it is helpful to get an overview of the 12 Books of Paradise Lost. The story’s action takes place in three settings: Hell, Heaven and Earth (ie. Paradise/the Garden of Eden). The main characters are God and His angels, Satan and his angels, and Adam & Eve. 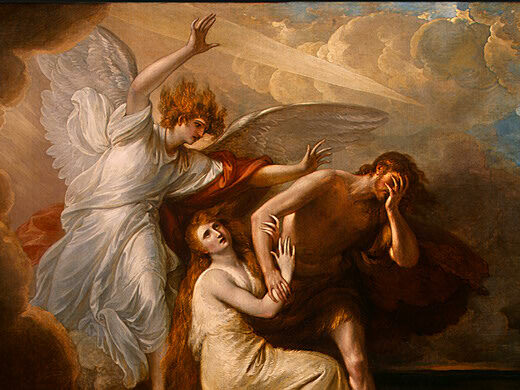 Paradise Lost is written in blank verse – unrhymed iambic pentameter – and the language and style Milton uses is certainly challenging for the modern reader. Before reading Paradise Lost, you should definitely read Genesis chapters 1-3 if you are unfamiliar with it that passage. I also recommend using a text that includes footnotes or a study guide, at least until you get a feel for it. If you are not sure you want to read the entire work and were to choose just a few of the sections to read, I would recommend Books 1-4, 6, 9 and 10. Having read the Genesis account numerous times, I was interested to see how Milton’s poem would compare with the original version. Obviously Milton has taken some “poetic license” by adding to the original account, but I didn’t find it to be sacrilegious and to be fairly consistent with the scriptures. While Milton does incorporate good theological doctrine, the reader must keep in mind that many of the events and dialogue which take place in the narrative are speculative, particularly the events which take place in heaven between God and the angels. The battle between the heavenly angels and the fallen angels is to some extent an allegorical picture of the English Civil War, and is purely fictitious and actually pretty entertaining. While based on the Biblical accounts, much of the narrative is a product of Milton’s artistic interpretation and imagination. In Paradise Lost, Milton combined a familiar religious story with complex poetry. The poem allows those who reverence the Bible to enjoy a retelling of one of the most important accounts in all of Scripture. It also gives those who appreciated poetry something to read that is challenging, meaningful, and edifying rather than secular and simply entertaining. The reader who has a good knowledge of the Bible will be able to distinguish passages which are based on scripture from those which are fictional. The work could be problematic if a reader having read Paradise Lost were to draw the conclusion that the Genesis narrative is as fictitious as the poem. It is hopeful that some who pick up Milton’s work but are unfamiliar with the biblical account would become interested in reading Genesis and profit from the truth it contains. To set himself in Glory above his Peers. It is Satan’s pride that brings about his downfall, and also pride that contributes to Adam and Eve’s disobedience and fall. In both Satan and Eve in particular, we see their pride turn to ambition, envy, discontentment, idolatry and rebellion. The necessity for humility in the heart of the fallen creature is evident. Milton’s account also shows that Satan comes to a different end than Adam and Eve primarily because God did not intervene on Satan’s behalf, while He chose to show mercy and grant repentance to Adam and Eve. For a more extensive discussion of these points with specific examples, read “A Comparison of the Falls of Satan and of Humanity in Paradise Lost.” Biblical truths concerning the character of God, the work of Creation, Christ’s incarnation, man’s depravity and sin, predestination and election, and the final judgment are all found in Milton’s poem. Note: Even though Paradise Lost is based on events described in the Bible, I have included it on my list of fictional works I believe every Christian should read because Milton added so much material that is imaginative. P.S. While I was searching websites for resources and articles on Paradise Lost, I learned that there have actually been plans in the works for a movie starring Bradley Cooper as Satan. At first I was excited about the idea, but then I began to imagine this subject in the hands of a Hollywood director and changed my mind. For this movie wouldn’t just bring a classic narrative poem to the big screen, it would involve portrayals of God and Jesus Christ, and would depict one of the most significant events in the history of mankind – the event that explains the very nature of man and the reason for God’s eternal plan of salvation. I have no doubt that the film could be an exciting fantasy epic on the level of The Lord of the Rings, but at the same time it would have a great potential for making a mockery of the sacred Biblical account that Christians hold to be true. If you’ve read Paradise Lost, which part(s) were your favorites? What do you think: should Paradise Lost be made into a movie? This entry was posted in Christian Books, Fiction, Poetry & Drama and tagged Adam and Eve, epic poetry, fall of man, fallen angels, Garden of Eden, John Milton, Paradise Lost, Satan. Bookmark the permalink.